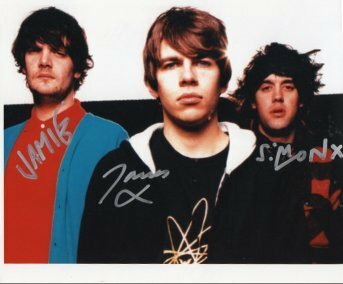 â This is not a print or a copy, but an actual item signed by all 3 band members â Full Colour glossy photo measuring 8” x 10” (approx 20cm x 25cm) signed in silver â 100% Lifetime No Quibble Guaranteed Genuine â Certificate Of Authentication â“ ID Number unique to this item â Shipped in professional board backed envelope â 6 Flat Rate Shipping to any destination in the World - No extra charge for additional items â FREE Insured Shipping if you purchase 3 or more items About The Photo 8” x 10” is an industry standard size for photos. It’s look great as it is but if you wish to frame it then you’ll have no problem buying one ‘off the shelf’ in this size. About Us: We are pleased to be new to Bonanzle we’ve been in the music industry professionally since 1984. We promise to act with honesty, politeness and integrity at all times. Whereas some other autograph dealers sell a wide variety of items (TV, Film, Sports, Celebrity etc.) we ONLY deal in music and specialise as such. We DO NOT sell copies or reprints. How Are The Autographs Obtained? ALL of our items are supplied to us by a handful of established music and media industry employees and contacts, people we’ve known both personally and professionally for many years. We only offer sourced directly from them direct because we know they are ‘right’. We do not trade with other dealers/sellers. Neither do we take part in ‘organised’ signings which means that often our items are unique and exclusive to us. 100% Lifetime Guarantee: Every item is Lifetime Guaranteed 100% Genuine. if you wish to sell or gift your item in the future the guarantee is transferable and remains with it. Who Are Our Customers? Anybody and everybody! Sometimes a one-off customer looking for a present, we have many regulars too. We often sell to dealers and also have the pleasure of supplying items for exhibitions, galleries, archives and collections of major music industry names in the U.K. and U.S.A. SHIPPING We charge a flat rate of 6.00 to any destination in the World. No extra shipping for additional items. ** Special Seasonal Offer ** Buy 3 or more signed items and receive FREE Insured Airmail Shipping. PAYMENT Paypal or Western Union Money Transfer.